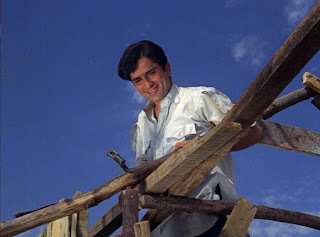 Sixty-second plot summary: Cheerful simpleton Raju (Shashi Kapoor) dreams of being a prince. 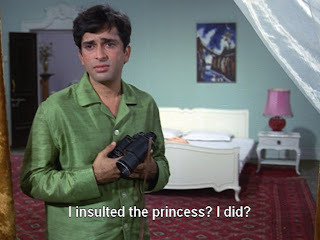 When given the oppotunity to masquerade as a an actual prince, Pratap Singh (Rajendranath), at his behest, Raju falls in love with an actual princess, Poonam (Nanda). 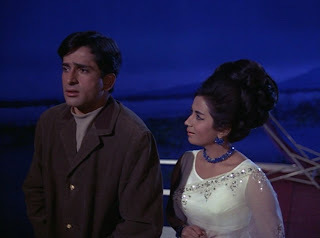 But he soon feels guilty lying to her, tells her the truth, and abandons idyllic Kashmir for his old life in Bombay. 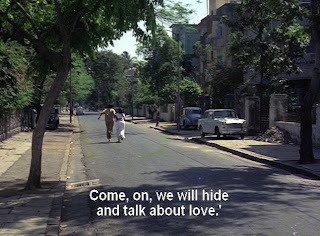 Poonam realizes how much she loved him and that that the only way to be with Raju is to live as he does, so she moves to Bombay and pretends to be poor, thus putting them back on "equal" footing. They continue their relationship based on these new lies, but interference from her family and Raju's new-found zest for truth threaten their love. Oh no! How will pyaar conquer all this time? Memsaab and Old Is Gold have described the plot in further detail, if you're interested. 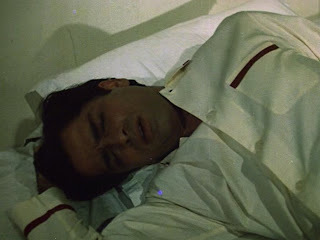 It might just be time to admit, in public, that apparently I am too emotionally invested in Shashi Kapoor's hair. "CUT IT NOW PLEEEEEEEASE!!!" 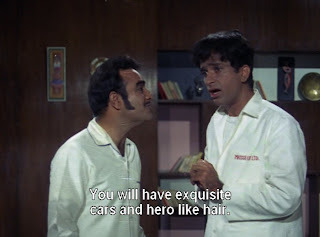 said the little snarky but frightened voice the back of my head as the opening scenes of Raja Saab rolled across the screen. 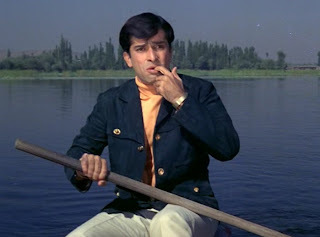 I don't know what the opposite of sublime is - anxiety over Shashi's hair certainly felt like an intense (if brief) phase of aesthetic displeasure - but somebody was toying with it here. It's not just Raju's ponytail thingy that I dislike: his child-like, poofified, full-frontal bangs really mess with his overall appearance. (Ever notice how different Shahrukh looks in his early days with his bangs all brushed down compared with what he generally does now, with at least part of his hair up or otherwise off his face?) 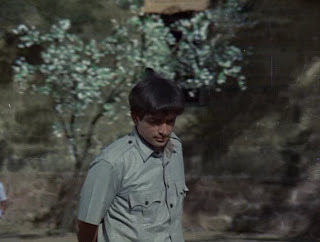 (Further diversion about Shashi's hair: in the interviews on the Merchant Ivory Collection DVD of The Householder, Shashi actually talks about how he decided to get his hair done for his role as a low-ranking Hindi teacher in Delhi, consciously undoing his low-ranking movie star waves. 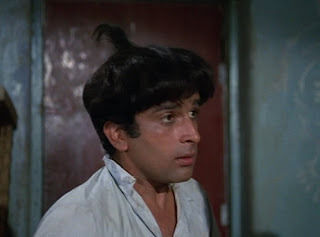 Also, in The Kapoors: The First Family of Indian Cinema, it is mentioned that Shashi's mother used to fuss over the wave of hair over his forehead. Perhaps inherited from big daddy Prithviraj, whom the book also describes as so concerned about his own hair that he would tug on it to encourage it to grow stronger.) I do have to give the...who's in charge of hairstyles in a film? the wardrobe department? makeup?...anyway, those people credit for making such an impact. 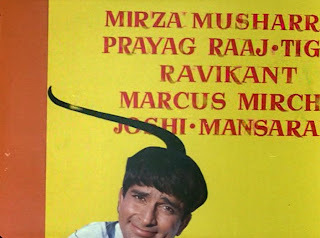 The hair was a conspicuous component of the characterization of Raju, and it even came up in dialogue. That's some impressive integration. 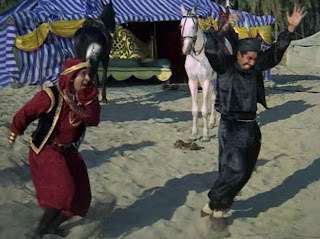 Fortunately, the first major plot device in the story is Raju taking the place of Prince Pratap Singh, so he quickly gets a makeover (and I do love a good makeover in a movie, even though it's a vaguely offensive concept most of the time). Is that a promise, your highness? Thank merciful heavens! The hair is the first thing to go. 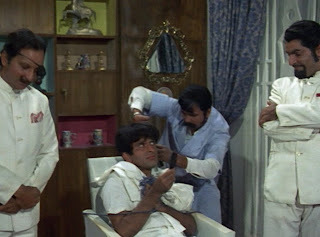 Then it's bath time, in a cute scrub-a-dub scene with much flailing and splashing (and the second iteration of comedic shenanigans involving Raju being requested to undress). This scene is accompanied by the sound of a conch shell horn. Like bathing in the Ganges, perhaps? New clothes, etiquette lessons, et voilà! bugging eyes, a loping walk, and awkward posture. 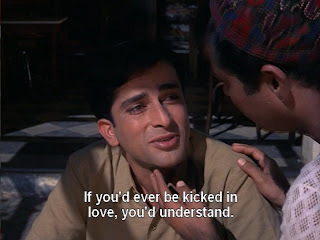 Raju does have his moments of charm, though. 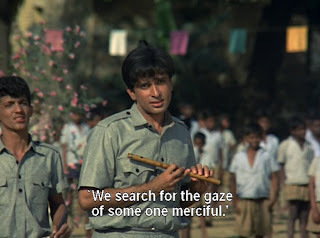 In "Raju Ka Hai Ek Khwab" - with boingy, lolloping instrumentation that mirror Raju's upbeat meandering through life (the intro is particularly awesome), as well as Rafi's dreaming vocals - Shashi skips through the streets with a gang of children and dreams aloud in the sunshine. It's so sweet. 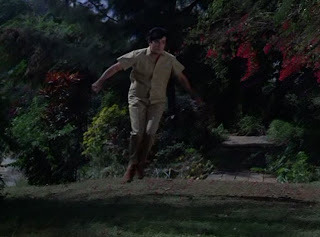 and while some of the Jerry Lewis-y, slapstick-y moments are not to my particular taste, they suit the character. 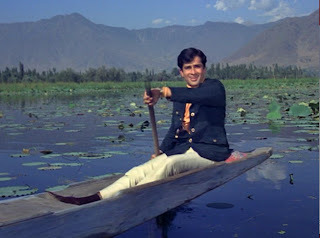 When Raju pretends to be a prince, Shashi doesn't do "handsome Shashi Kapoor is a prince in this movie." He does "anxious Raju tries his best to be confident and charming but at his core is still nervous and hopeful and goofy." Is the movie saying that rich, sophisticated people are emotionally manipulative and dishonest and don't care about consequences? And that pure love can only flourish if all other trappings are stripped away? I don't know! and wiser Raju, who is still wants to trust his heart but has the slight hesitation and dampening of someone who feels mistreated by love. 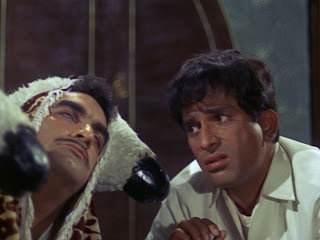 His portrayal of Raju is impressive, really, when you think about all the elements he changed throughout the movie and that are different from his more typical presentations of either suave-os or flustered lover boys. But it is not something I ever need to see again, especially when I remember that this film is by the Jab Jab Phool Khile team who might be trying to sucker me into thinking that a lack of education, being prone to detaching from reality, and rigidly categorizing people's lifeways are charming, noble qualities. 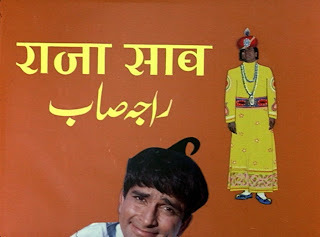 I found Raja Saab to be less sinister than Jab Jab Phool Khile, but I'm still bothered that it is again the woman who makes the bigger, more relationship-specific sacrifices in order to "save" the relationship. However, Raju adjusts as well, though I would argue most of his changes are larger life lessons that he should learn anyway. 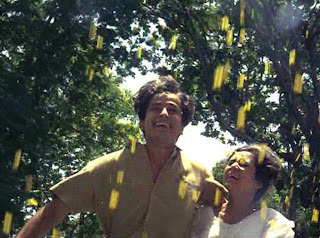 Even better, Poonam and Raju both learn important principles and make changes in their beliefs and behaviors accordingly: she learns money isn't everything and that people outside of her social set can be good and lovable, while he learns to be practical and to focus on and nourish what he has rather than dream about a useless fantasy that offers him no real benefit. Whether it is through his adventure of princely pretending and subsequent bubble burst or because of a conscious choice of pragmatism, Raju does let go of his fantasy life and becomes a functioning member of society. Fortunately, Raju doesn't seem to lose much of his sweetness and good-natured cheerfulness in this change. The movie usually lets him have both (except when trauma-drama calls for him to be sad, distraught, etc.). 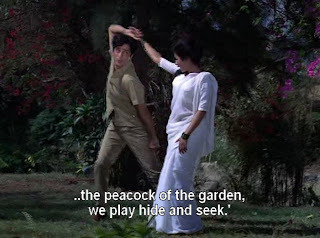 as in the joyful romping peacock duet "Tu Jungle Ki Morni." Because this same song is reprised at end with footage of hand-holding and literal home-building, do we assume things are mutual and on strong shared foundations? And that Poonam really feels good about the choices she's made and the new life's she's jumping into? I'm not sure. 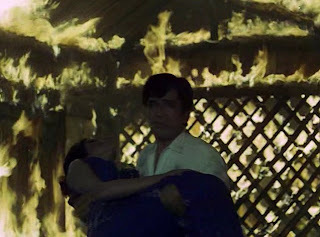 After leaving her family and the life she knew, she runs to the house she and Raju have been building and finds it in flames. 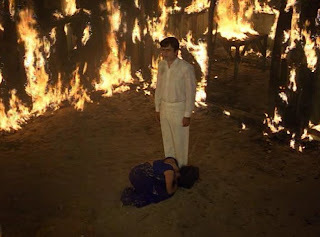 Raju has set it on fire, saying he cannot stand that his ambition (I think meaning both his fantasy life and his relationship with Poonam) was built on lies. Poonam cries that he has done all the talking and made all the decisions without giving her a chance to sort everything out, listening to her, or letting her talk. At this point I yelled "YOU GO GIRL!" She continues to stake her claim in their (metaphorical) house, saying that they built it together and that it is true. He insists it is dishonest, so she responds by saying she will burn to ashes along with their house as her trial by fire. Ooookay. Very filmi. And then it skidded off the rails for me, with Poonam saying "I am yours, just yours" and throwing herself at his feet, which reminds me way too much of the end of Jab Jab Phool Khile, when Rita runs after Raja's departing train and goes on about how she belongs to him and will take the name he gives her and blah blah blah. Overall, though, I think the imagery in the scene is much worse than the words. Tell me, do these images look like a mutual relationship to you? Umm.... How 'bout neither person seems to need saving and instead they save the house together? Sigh. At least Raju realizes that his own charade has been as problematic to their relationship as hers, and it's not 100% awful, and if I back her speech up by a few sentences I'm pretty happy, cemented by the cute song reprise ending. Phew. This was one of those movies that at first struck me as being pretty simple, and then I thought about it further and realized there might be a lot more going on. PPCC and I were talking about how sometimes we see more in films than the screenwriters ever intended, but heck, what is art and creative energy good for if not expressing ideas and inspiring thought and discussion, eh? 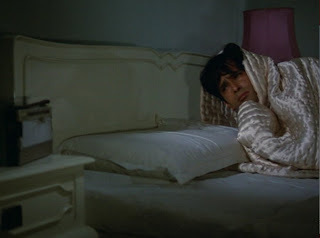 It keeps me up at night too, Raju! Let's see, what else? The movie has some pretty visuals, especially the love scenes between the royals in Kashmir. 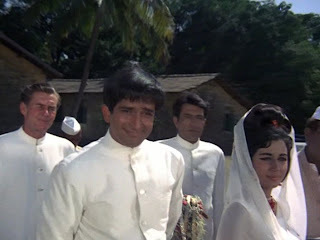 Somehow the natural beauty of the scenery is not overwhelmed by the very artificial beauty of Poonam's 60s bombshell look, though it must be said her hair is of Himalayan proportions. There are a few delightful props. Quick! To the cat phone! For reasons that are never made clear, the prince sleeps on a sheep-adorned bed. 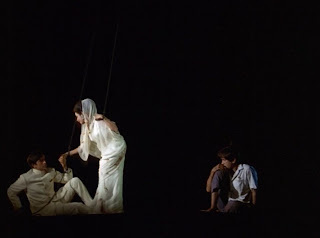 One of my favorite scenes is a creative dream sequence in which Raju frets over his pretend self, a puppet controlled by some unseen force (as is Poonam) triumphing over his true nature. 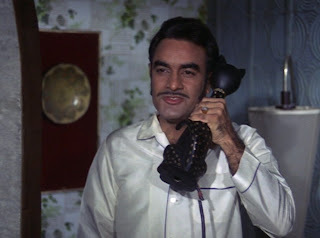 Hindi cinema really knows how to make good use of people pretending to be puppets, doesn't it! 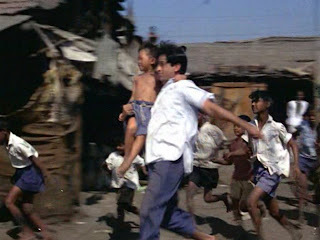 Raju recoils empathetically as Poonam gives this loser a tight slap. 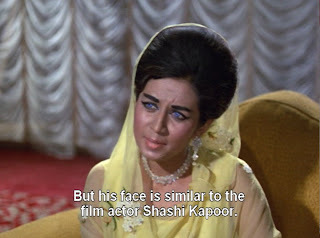 and, for the third time in the last few months, I enjoy some self-referential garamissimo* Shashi humor. There's even a reference to Shakespeare-Wallah! Huzzah! 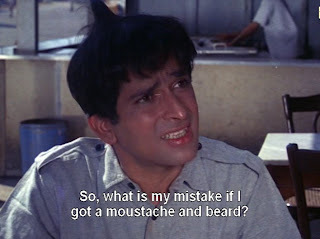 Even if I made too much of some of what goes on in this movie - and you can't be too careful as far as the Jab Jab Phool Khile team is concerned, in my book - there is plenty of the fluffy and filmi drama variety to enjoy too. It's hard to go wrong with 60s styling. 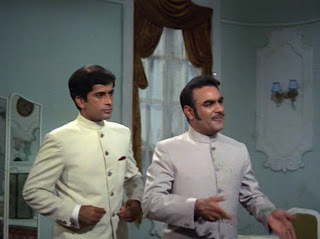 Anandji-Kalyanji's songs have some great moments; I was not in the mood for "Jinki Kismat Mein," the mopey reprise of "Raja Ka Hai Ek Khwab" just before the ultimate dramatic exchange at the end of the story, but the two songs mentioned above are really fun, as is "Kal Raat Wali Mulaqat," in which Raju follows Poonam around Kashmir, comically (but earnestly) pleading her forgiveness for an accidental insult. 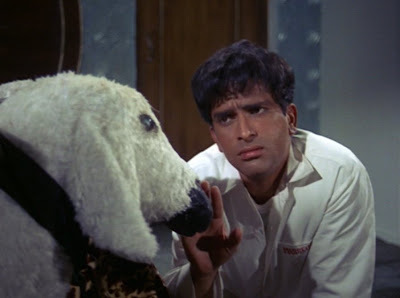 Shashi provides several interesting performances, and Nanda...well, I'm looking forward to seeing Nanda in a less annoying role some day. Poonam is hard to really like, but she has her moments of cute when her pretensions come down but she hasn't yet thrown herself at Raju's feet. Putting aside the sometimes troubling things the film says about Poonam, I think it at least tells us something very nice through Raju: our true natures, best efforts, and life lessons can live in harmony, and that we'll be happiest when we are ourselves. As I wrote about a zillion times as I took notes on the movie, awwwww. * Hindi-Italian terminology courtesy of PPCC. I hated 'Jab Jab Phool Khile' too and the Aamir Khan- Karisma Kapoor version 'Raja Hindustani' too though that's the film that pushed Karisma into the big league. I guess Indian audiences still LOVE the subservient female. Yes, yes, half the fun of seeing the film is to think and talk about it, and read all kinds of meaning into it. That's why I don't much like enjoy watching films on my own. Me toooooo!!! And I am a terrible talker during films - good thing I don't have anyone in town to watch Bollywood with me, I guess, or I would drive them crazy. "Chat cinema" works well though because the discussion is built into the name. Thank goodness for conversations, in whatever medium they may be - and the conversationalists too! This sounds rather nightmarish to me. I abhor good-hearted fool characters and even more films about someone finally taking his responsible position in society. The "become a well-functioning cog in the machine" genre was not made for me. Apart from romanticising and ennobling poverty, I think the movie is also conveying that though socio-economic gaps can be bridged, its the job of the woman to do so in any relationship. 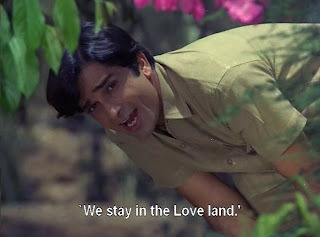 Nanda's character in Jab Jab Phool Khile was bad because she *gasp* expected her man to adjust to her life while here, she knows from the beginning that its she who needs to embrace his life and does everything possible for it. 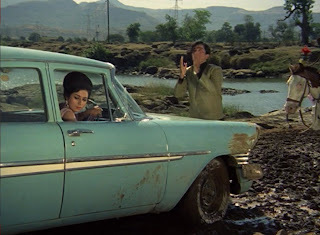 That a woman must sacrifice and enter her husband's world is a recurring theme in Indian movies and even mythology - Mahabharata's Gandhari permanently covers her eyes when she marries a blind man, Ramayana's Sita leaves royal comforts to accompany her husband in his exile. 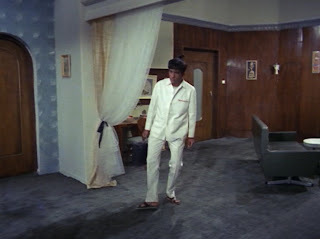 There were a lot of 60s and 70s movies where the rich girl marries a poor guy and the marriage runs into trouble because rich girl (or her family) cannot adjust with her marital poverty (Jaya Bhaduri's Kora Kaagaz, for example). However, everything ends "happily-ever-after" once the woman realizes her *error*. I agree; not a great film, annoying in parts feminist-wise, but not as bad as JJPK...and plenty of other cuteness and style to make it enjoyable. 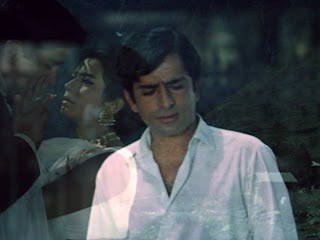 And Shashi's hair at the beginning...gave me the heebie-jeebies too.